Facials are used to improve the look and feel of skin on the hands, face and neck. Clear Sky Medical offers custom peels as part of its Medical Aesthetics and Spa services. Facials can improve moderate discoloration of the skin, age spots, freckles fine lines and wrinkles. The American Society for Dermatologic Surgery outlines three levels of peels: superficial, medium and deep. The level of peel you will need should be determined by a specialist at Clear Sky Medical during your consultation. Below we outline some of our peels. Our newest addition is the NuFace mini microcurrent face lift. Rejuvenate your face and neck by toning, lifting and reducing wrinkles with NuFace’s patented technology. A rejuvenation facial designed to reverse signs of time on your skin, treat fine lines and texture. This luxurious treatment infuses powerful anti-aging antioxidants, combined with skin rebuilding peptides and glycolic. Your skin will look radiant lifted and brighter. A customized facial that is designed to treat age spots and hyperpigmentation. The combination of peptides, glycolic acids and antioxidants assist in providing beautifully resurfaced, hydrated, luminous skin. Refresh your skin with this calming treatment that is focused on sensitive skin and redness. This treatment protocol includes the proteolytic enzymes of green, unripened papaya to gently exfoliate and resurface the skin. Followed by a soothing, hydrating mask. Skin will feel hydrated and look radiant. This facial is designated to target troubled oracneic skin. You will receive a gentle, thorough cleansing and exfoliation. Extractions and mask help heal and balance your complexion. Indulge yourself in this lavish treatment designed to help you achieve healthy, glowing, hydrated skin. Relax as the natural harmony of your skin is restored, revitalized and refined. Included in this facial is massage of the face, decollete, shoulders and hands. 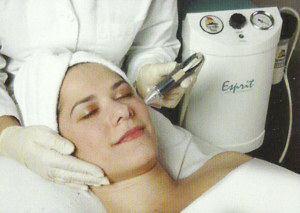 Combine a Microdermabrasion and a peel to receive the ultimate in treatment. Microdermabrasion gently exfoliates off the dry outermost layers of the skin, allow gin the peel, peptide or moisturizing lotions to better penetrate into the skin. Ask us about our Corrective Treatment combination and other services. The MicroPlasma Peel, powered by Juvashape from Alma Lasers, gives you the ability to fight the visible signs of aging where it matters most, your face. Using micro plasma technology and focused RF we can help you reclaim some of what time as taken away. Using focused radio frequency, your provider will create microscopic perforations in the surface of your skin. The technology leaves the skin surrounding the micro-wound intact. The focused RF goes to work in the deepest layers of your skin. Simultaneously, the healthy tissues promote healing and return to the natural, radiate appearance of your youth. Leave the years and all the sun behind. It’s time to treat your skin to Parisian Peel, the gentle approach to sin renewal. The Parisian peel process smooths and freshens your skin, the way the French have enjoyed for years. It’s not a chemical, not a laser, not a surgical procedure. Instead, a gentle Parisian peel treatment takes about 30 minutes after which you can return immediately to your daily activities. You’ll feel minimal discomfort, only the glow of newer fresher skin. The Parisian Peel process can reduce or even erase your fine lines and wrinkles, age spots, scars or other superficial blemishes. It usually takes 5-10 treatments to get the best results. Talk with your physician about a treatment plan that’s right for your skin type and condition. Because the Parisian Peel process is so gentle, you can have as many treatments as you need without worrying about side effects. For more information and a consultation on all our options, give us a call at 303-790-7860.